Portion of the software features that are defective. I owned and used version 2 of Rosetta Stone and made the $620 mistake of purchasing the version 3 edition. One of the primary reasons I purchased Rosetta Stone was that it is available for Mac, however what follows are comments that will be of definite interest to Windows users as well. There are fundamental problems with the software, particularly in the pronunciation and speech analysis sections of the software. I am attaching a screen shot of the portion of the software that causes the problems. When contacting customer support by phone they instructed me to re-install the language portion of the software. I did, and this did not resolve the problem. What happens is that the recorded voice portion as well as the played back voice of the native speaker is heard as a chopped up stutter. This is not only annoying, but when my voice was recorded, it caused a corruption of the analysis of my pronunciation as well. In addition to this problem, the headset which was included with the software was defective, which added to the complexity of troubleshooting the software problems. What is even worse about all of this is that Rosetta Stone has an unyielding policy of not replacing defective software or accessories at a point of purchase. This is so even if you buy the software from a company owned kiosk, which is where I bought my product. Their customer support is also always closed from Friday afternoon until Monday morning. So, if you expect help on the weekends, forget it. So, the bottom line is if you have trouble with the software or accessories you must deal directly with the corporate office to receive any help or customer satisfaction of any kind. In addition to this, if you insist of a refund you must pay all shipping cost of the return of the merchandise to the company headquarters in Virginia with this after getting a return authorization from the company. What this means is, after spending several hundred dollars for defective merchandise you are unhappy with that technical support cannot repair properly, you will have to endure the hassle of boxing up your purchase and sending it to the corporate headquarters at your own expense after receiving "permission" to return the defective products you bought. To say this is a hassle is a gross understatement. Their e-mail support is frustrating as well. I clearly indicated my computer was a Mac running OS-X operating system. I received instructions on how to re-install the language data on a Windows based machine. This indicates on its face that the technical support personnel does not pay attention to even the most basic details of a customer's inquiry; and this should be of concern to anyone thinking about purchasing Rosetta Stone, regardless of what kind of computer they use. Moreover, they also kept telling me to re-install the language disc data, when it was clearly documented in my file that I had already done this over and over to no avail. I purchased the new release of Version 3, and I would like to emphasize that I am convinced there are fundamental problems with the software itself which may in fact be due to inadequate testing prior to release. No customer should be faced with dealing with these kinds of problems, and then cannot return the product to the point of purchase for replacement or refund. Unfortunately, what would be an otherwise very useful product is not worth purchase because of horrible company policies that destroy customer confidence, and a technical support department that is ill-equipped to effectively deal with customer needs. For the reasons shared with you I would definitely not recommend the purchase of Rosetta Stone by any Windows or Mac user, period. Join in and write your own page! It's easy to do. How? 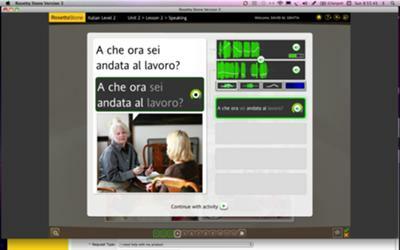 Simply click here to return to Rosetta Stone Review.